Does anyone know if the listed exam locations for the 2018 February exam are likely to be the same for the 2018 July exam? I’d like to make my hotel bookings ASAP as there are some good prices being advertised for hotels in my preferred exam location, one of which is directly across the street from the location listed for February exam (Downtown San Diego). Being a seasoned traveler, I’m anticipating prices will jump up as soon as the March 1st registration opens and hotels local to exam sites realize the potential for large numbers of travelers. For what it’s worth, I do realize there will be hotel discounts published on the CA Bar website after March 1st, but those are not usually for the top tier luxury hotels, and my spouse wants to splurge on a luxury hotel for my bar exam week. Thanks! While it’s an amusing blog entry about the worst seediest motel in San Diego, I’m not entirely sure of the relevance to this discussion about the July 2018 bar exam. Some exam locations often change in rotation, while others are constant. I know Pasadena, Ontario, and Oakland are consistent exam locations. Sometimes the San Diego and Sacramento locations are limited to examinees who reside in the city. FutureEntAttySP wrote: While it’s an amusing blog entry about the worst seediest motel in San Diego, I’m not entirely sure of the relevance to this discussion about the July 2018 bar exam. You expressed your intent to secure a hotel reservation. Your TLS colleague provided you with an option. It's trash. But still relevant within the meaning of the FRE. Punish yourself. Also, my understanding is there is rarely fluctuation (except for the Testing Accommodation places) so you should reserve it meow. Pretty early but thanks for starting the thread! As usual, I'll drop in some helpful info collected over the years. Scroll down to [*7] for more information. Go here for my totally unbiased review. Then, feel free to reach out here for a $30 coupon; the person whose code you use gets a small kickback, $15 in my case because I'm not doing the 30/30 refer-a-friend program. If you're re-enrolling, there's a substantial discount, no need for a coupon. The owner has raised the price in recent months, and I don't blame him. Fortunately, I have a coupon code that will save you $25 on a subscription! Unfortunately, PMs are no longer available; please get in touch here. I have also put together a guide to own the PTs (v. 1.5d), including a step-by-step approach to answering the a PT, and a list of PTs to practice in order of difficulty. It is indeed rather expensive, but it’s probably the single best comprehensive option to study for the MBE, assuming you have the budget. Feel free to reach out here for a coupon code for $30 off an AdaptiBar subscription; the person whose code you use gets a small kickback, $15 in my case because I'm not doing the 30/30 refer-a-friend program. Does anyone know whether or not you can use a discount code with Adaptibar if you can already receive the retaker discount? CalBar2 wrote: Does anyone know whether or not you can use a discount code with Adaptibar if you can already receive the retaker discount? I don't believe you can use the discount if you're already getting the retaker price (which is already a pretty steep discount @ $215 or so). You can try it, but I've heard from people saying they couldn't. Thank you. I went through your post as well as your website and the information you provide everyone is very helpful. Do you happen to know whether or not Strategies and Tactics is coming out with a new edition of their book by any chance? I'm about to order the 6th Edition as you recommended. I'm not aware of any new editions coming out anytime soon based on quick research. 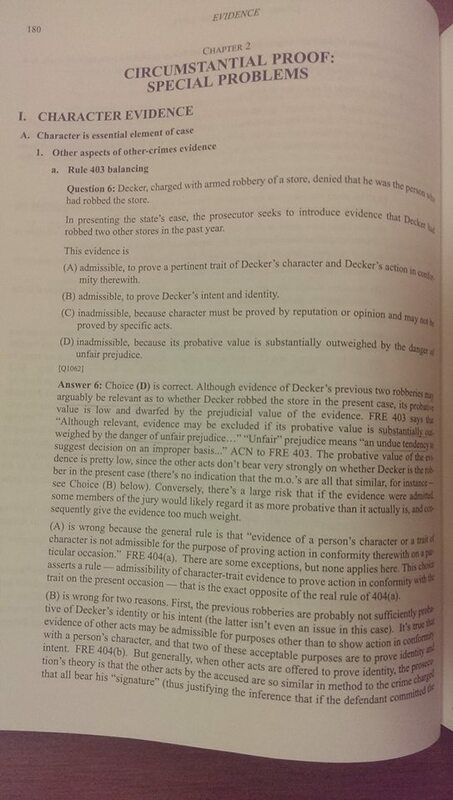 One day, the author might come up with a new edition based on the questions that the NCBE released recently [http://store.ncbex.org/mbe-study-aid-download/]. For now, if you want those questions, you'll probably have to get them separately (note that the Study Aid doesn't come with annotations/explanations). Has anyone taken the exam at the LA Convention Center and have any idea what the parking situation is for the exam? Checking in. First time Ca bar exam taker. Did my first bar exam this Feb. for Texas and now I'm moving onto Ca. Best of luck to everyone, let's do this! Checking in! Began my Themis course! I took Feb 2018, and I used this exam calculator, I either passed by 3 mbe''s or failed by 3 mbe's, unfortunately, the calculation isn't exact because the formula CA uses isn't published until after the release of results. So, I haven't started studying yet, but think I should get a jump on it. Thoughts? You guys are getting a head start huh? cgc, do you have a link to the calculator? I'm surprised that this post hasn't triggered much attention. Has anyone started the prep for the July 2018 CA Bar Exam? I took and failed this exam 5 times. The Feb 2018 exam was my 6th attempt and I somehow passed. On the one hand, I feel so happy and relieved. It feels like the nightmare is finally over... like a ton of weight has been taken off my shoulders. On the other hand, I know what it feels like to fall short time and time again. When I failed for the 5th time (last July), I got the closest I've ever been to passing (scoring 1410) -- thanks in large part to MBE now being worth 50%. While my circumstances might not be the exact same as many of yours' here, I thought it would be worth sharing how I studied/prepared this time and finally passed the bar. I almost passed the July 2017 exam mainly on the strength of MBEs (scored just under 150.0). What really hurt me was getting a 55 on one essay and getting a devastating 50 on the PT when I ran out of time + barely wrote 2-3 paragraphs. I'd say the two biggest changes I made up front were (1) setting aside a full 10 weeks to study (as opposed to 7-8 weeks) and (2) making a detailed day-by-day study calendar. I almost always studied at a library. Overall, a typical day of studying would run 9 to 6... but it's not like I was studying the entire time (e.g. break time, lunch, etc.) With all that said, I was in a fortunate position to be able to study full-time for all 10 weeks. I understand that it's not a circumstance that's available for every one. And another thing, I spent practically zero time on watching lectures or reading notes. I think I referred to old outlines I had only when adaptibar's answer explanation wasn't cutting it for me. Another commitment I made up front was to make sure I prepared for everything. The temptation to double up on my strength (MBE) was alluring, but given that I was failing over and over again I clearly had to try something different. So I told myself I would put in the time to become well-rounded in preparing for the essays and PT. Based on my study calendar, I did 30 MBE questions and two essay subjects a day. Every 2 weeks (I picked Wednesday), I would swap out the essays for a full practice PT. As I got closer to the exam date, I did a practice PT basically every week. I think in Week 5 or 6 of studying, I did a full practice bar exam, with Tuesday as the written day and Wednesday as the MBE day. Needless to say, it was all under test conditions. As mentioned earlier, I did 30 MBEs a day, and that's how I would begin each study day. In total, I did about 1900-2000 questions in total (including repeat questions). I first used Emanuel's Strategies & Tactics to develop a foundation (in terms of forming a strategic approach to MBEs), and then I used Adaptibar exclusively. As I go through the set of 30 Qs, I'm marking down questions I'm "uncertain" about. 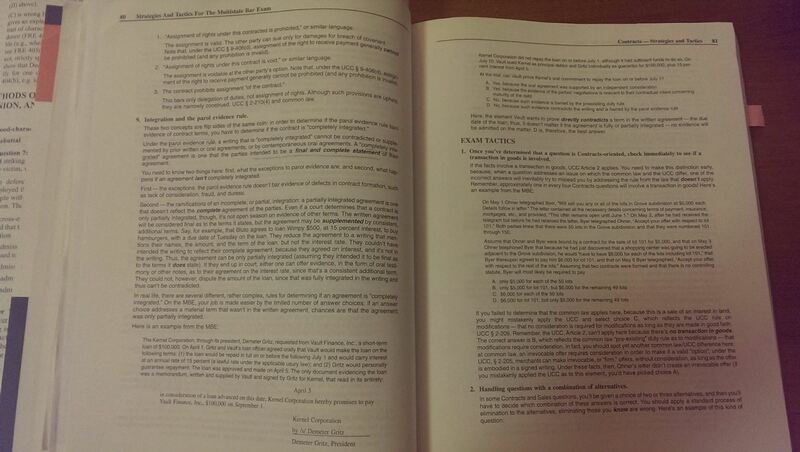 Once I finish, I go through not only the wrong questions, but the ones I marked "uncertain" as well. When you're reviewing questions, don't just look at the correct answer... but try to figure out why your wrong answer choice was wrong. In the short run it felt like a burden, but it really benefited me in the long run to do that. As I review answer explanations, I compiled them on a google doc. Before each 30 question set, I would review the google doc and trim/delete or edit the answer explanations (in my own words) as necessary. Make sure to clean up the doc often because if your experience is anything like mine, the doc can get very lengthy (20+ pages). Last few thoughts on MBE practice? Don't worry about seeing repeat questions on Adaptibar. Try your best to empty your mind of what you thought the answer might have been, and focus on applying the method/approach you've been rolling with. If I'm honest, I think I tried too hard to find the path of least resistance here. 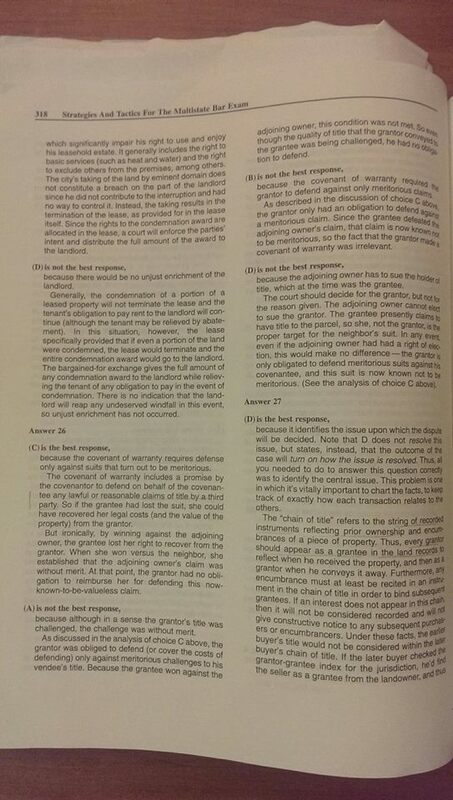 For past bar exams, I would look up BarSecret's predictions and do 3-5 practice outlines per predicted topic. I figured that if I did decently on 2-3 essays, I could pass the bar based on my MBE performance. I also, admittedly, had a mental block when it came to practicing essays. It felt both like crazy boring work I wanted to avoid as well as overwhelming given the amount of stuff I'd be forced to memorize. In hindsight, I think my fears were largely proven wrong. An overview of how I practiced essays: During the first 2-3 weeks of studying, I would only do ONE essay per subject (so two total essays that day). In these initial weeks, I would fully write out these essays WITH an open book + a 2-hour time limit. In short, I tried writing as good an essay as I could. It helped me get familiar with the essay topics and start slowly building a foundation. I won't lie, this part was pretty grueling (but it got easier afterwards). After that, for most of the 10-weeks I spent studying (between weeks 3 through 8 roughly), I outlined essays (and increased from 1 essay to 2-4 essays per subject). In the last two weeks before the exam, I just issue spotted going through 8-10 essays (covering 2-3 essay subjects) a day. In all this, BarEssays was a fantastic resource. After I'd be done writing/outlining/issue-spotting an essay, I would compare what I had written with what had been written (or not) on papers scoring 60, 65, and 70+. If there was a rule or strategy I'd frequently forget, I'd make a note of it on a google doc. I'm only speaking for myself here, but I did not have to rote memorize anything. Some people advocate memorizing the 13 most frequent rule statements per each subject. Do what works for you best. Once I had a few weeks under my belt, I began to notice how certain details or fact patterns that would implicate various/specific issues. You start seeing how there's only a finite number of issues they test for each subject. In time, I began to slowly articulate the rule statement in my own words... even if they didn't exactly match the "standard" phrasing on BarEssays. A few more weeks later, my momentum would continue to build as I saw how I was spotting most of the issues covered on passing essays. It also helped when I saw how many of these high-scoring essays were filled with typos/errors/etc -- they were far from perfect. As long as I've tried passing the bar, the PT was basically the neglected stepchild... even though it counts twice as much as an essay. I think my mindset really changed when I realized I could have passed the July 2017 exam if I had time to finish the PT (and score 60+) instead of running out of time and only scoring a 50 like I actually did. In terms of approach, I did about 7-8 full practice PTs. My focus each and every time was getting my timing down. Your approach may be different, but my goal was to finish reading+outlining in 30 minutes so I could have an hour-ish to write. During practices, I would mark down how long it took me to finish outlining and start writing. I think my first PT or two, it took me nearly an hour to read/outline everything. But I got better and better. I did all this with the strategy of doing the PT first and then the two essays in the afternoon session. On the actual bar exam, I spent just under 1 hr 40 minutes on the PT before moving on to the two essays in the afternoon session. Obviously I could have been a bit quicker, but this was far better than when I had only 25 minutes (in total) to start and finish the PT in July 2017. I think planning out a 10-week study schedule, making a detailed day-by-day calendar, and ensuring I'd do xxxx number of MBEs, essays, and PTs come the real thing was HUGE. Gave me not only structure, but assurance that no day was going to waste. I would just add that I designated 4-5 days as "free" days. I ended up using them for extra review, a day off to go to a friend's wedding, and another day off to go see Japanese Breakfast live. If my experience is any indication remaining positive is huge -- in both the small things (not letting a tough MBE question hang you up for the next 10 minutes) and big things (believing you can overcome the bar after multiple tries). It's also being honest with yourself with the adjustments you need to make in your studies. For me, it was admitting I shouldn't overly rely on my MBE performance for the bar and putting in the requisite work for essays/PT. This is already a long enough post as it is, but feel free to message me if you have any specific questions. 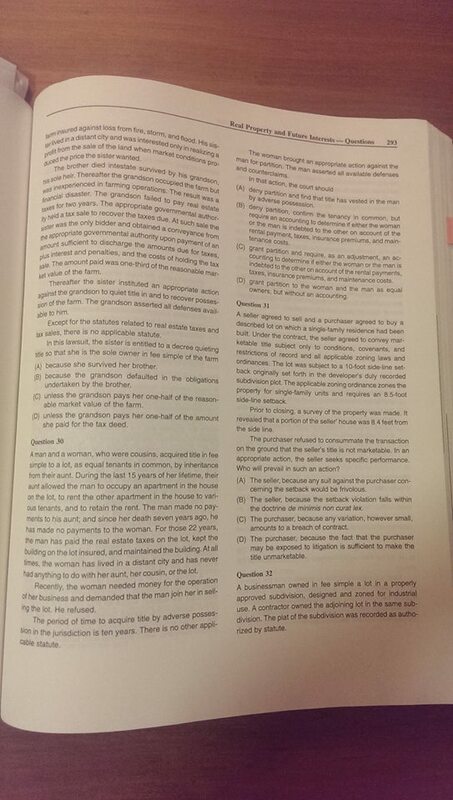 justanotheruser wrote: I took and failed this exam 5 times. The Feb 2018 exam was my 6th attempt and I somehow passed. On the one hand, I feel so happy and relieved. It feels like the nightmare is finally over... like a ton of weight has been taken off my shoulders. On the other hand, I know what it feels like to fall short time and time again. Thank you so much for your detailed review! Congratulations and I truly admire your courage and persistence. You deserve passing this exam! I practiced with the MPTs used on the MBE. They’re 90 minutes and I saw no substantive difference between hose and the ones CA has. Also, even though it’s only worth 14%, I think statistically your odds of passing are MUCH higher with a passing PT. Please use this calculator to run through the permutation. I am a practicing attorney who moved to California in December 2017. I took and passed the February 2018 Attorney’s Exam (just the essay/PT day; no MBE). I was lucky because my firm paid for bar expenses and gave me the two weeks off before the exam to study (plus the week of). I studied nights and weekends leading up to the period before my official bar study leave period. To all the repeaters who passed CONGRATULATIONS!!!! what did you do differently this last time that you think contributed to you passing?